Added on December 14, 2011 by James Johnson. Nearly half the pieces in the show are text-based—perhaps a predilection of Gilkerson’s, who has used text in her own work. One of the most charming is James Johnson’s '14K Sentences on Conceptual Art.' 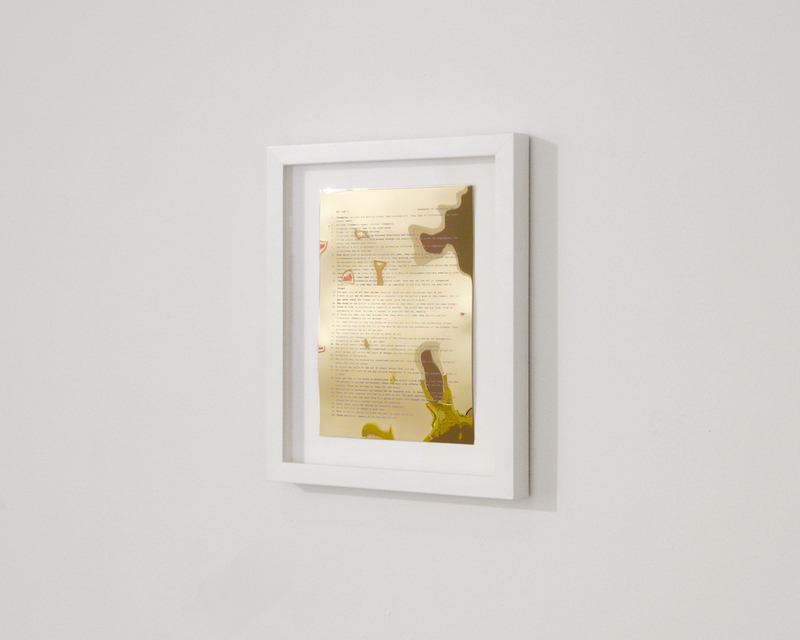 The piece consists of conceptual artist Sol Lewitt’s famous 35 'Sentences on Conceptual Art' printed onto a slightly warped sheet of 14-karat gold. The viewer cannot read them without seeing his or her own distorted, funhouse-mirror reflection, which adds a level of humor and depth to the words. Number 20 particularly resonates—'Successful art changes our understanding of the conventions by altering our perceptions'—as does number 35: 'These sentences comment on art, but are not art.' In this context, of course, they have become art.